ODONTOGENIC MYXOMA- A RARE CASE AND DIAGNOSTIC AND THERAPEUTIC CHALLENGES. 1) Department of Oral and Maxillofacial surgery, Faculty of Dental Medicine, Medical University Sofia, Bulgaria. Introduction: The odontogenic myxoma is generally considered to be a rare neoplasm unique to the jaws. In the international histological classification of odontogenic tumors, odontogenic myxoma (OM) is defined as a benign odontogenic tumor of mesenchymal origin that is locally invasive and consists of rounded and angular cells lying in abundant mucoid stroma. Since these neoplasms are rare in the oral cavity, the possible surgical management can be quite variable. Literature recommendation can vary from simple curettage and peripheral ostectomy to segmental resection. Purpose: To present a case of OM of the lower jaw in Department of Oral and maxillofacial surgery, Faculty of Dental Medicine, Sofia. Material and methods: The medical history of 18 year- old male presented a neoplasm in the right mandible molar area. Biopsy specimen taken from the lesion showed OM and a peripheral ostectomy as a surgical procedure was performed. Results: At the 1-year clinical and radiological follow up there was no sign of recurrence. Conclusions: Variations in radiographic presentation make a radiological differential interpretation of OM a challenge because the radiographic features overlap with those of other benign and malignant neoplasm’s. The current recommended therapy depends on the size of the lesion and on its nature and behaviour and can vary from curettage to radical excision. Deliverska EG. Odontogenic myxoma - a rare case and diagnostic and therapeutic challenges. J of IMAB. 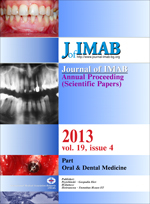 2013; 19(4):404-406. doi: 10.5272/jimab.2013194.404. 14. Ugrinov R. Tumours in oral and maxillofacial and neck region. Sofia. 2009; pp.384. [in Bulgarian].